Dr. Crainick joined our team in August of 2014. She is a 2007 graduate of the University of Illinois. For the past seven years she has worked in emergency medicine & general practice. She also completed two internships during her career. 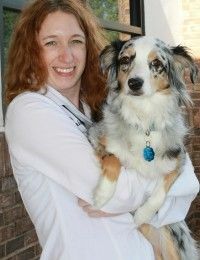 Dr. Crainick has a special interest in canine & feline internal medicine, especially gastrointestinal & endocrine diseases. She enjoys hiking, snorkeling & scuba diving in her spare time. She has two dogs, an Australian Shepherd mix named Merlin & an Australian Shepherd named Lily (pictured here). She is very happy to have come to sunny Florida from her home in St. Louis, Missouri.